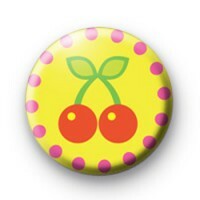 This is a really fun yellow pin badge with a kitsch red cherry in the centre and sweet pink dots around the edge. Its a simple but cute badge and if you're into a kitsch retro vibe this badge is ideal for pinning to your coat or bag. Who said fruit can't be fun.